At one point in history, a regular rookie card was enough to satisfy collectors. Then they had to be short printed or serial numbered. Next came autographs and jersey cards. 2011 Panini Plates & Patches Football combines all of these with each pack promising an on-card autographed rookie patch card numbered to 499 or less. 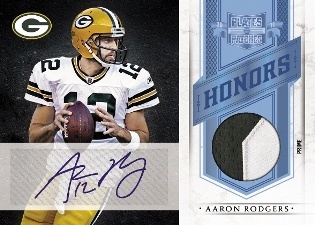 In the process, it sets a lofty benchmark as some of the most desirable first-year cards of the year. Each ten-card pack promises one of these rookies along with two autographs numbered to 499 or less and two memorabilia cards numbered to 299 or less. 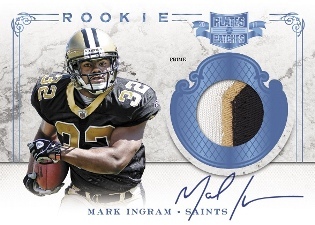 Each pack has one of 36 different on-card autographed rookie patch cards numbered to 499 or less. Rookie signers include all the top participants in the 2011 NFL Rookie Premiere such as Cam Newton, Julio Jones, Mark Ingram and Randall Cobb. Two more autographs per pack numbered to 499 or less. Two memorabilia cards per pack numbered to 299 or less. 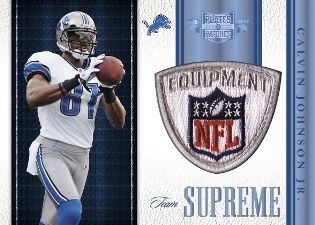 Product focuses on prime memorabilia pieces and printing plates. Autographed and autographed patch printing plates to be included. Signal Callers focuses on autographs from football's greatest all-time quarterbacks. 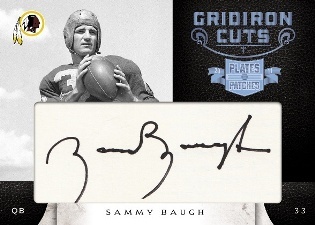 Gridiron Cuts features cut signature autographs. 2011 Plates and Patches Jonathan Stewart Patch Autograph True 1 1!